Smith, E.A. 1881. 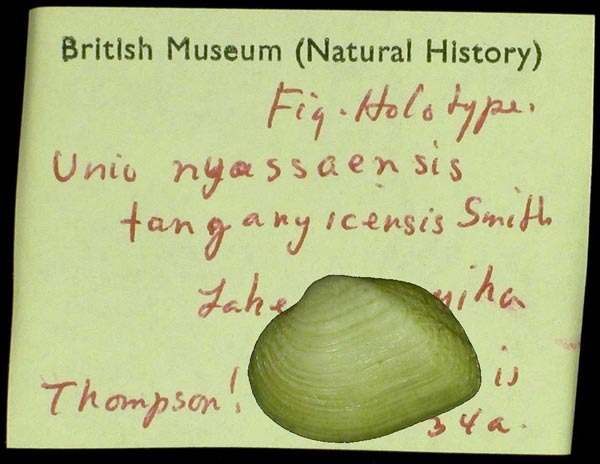 On a collection of shells from Lakes Tanganyika and Nyassa and other localities in East Africa. Proceedings of the Zoological Society of London 1881: 276-300. E.A. Smith, 1880, Proc. Zool. Soc. London: pl. 31, fig. 8a [as ‘Spatha tanganyicensis’] [in part]. E.A. Smith, 1881, Proc. Zool. Soc. London: 296, pl. 34, fig. 32 [as ‘Spatha tanganyicensis’]. Bourguignat, 1883, Moll. Fluv. Nyanza: 23. Bourguignat, 1885, Esp. Nouv. et Genres Nouv. Lac Oukékérewe et Tanganika: 38. Bourguignat, 1888, Iconogr. Malac. Lac Tanganika: 59. 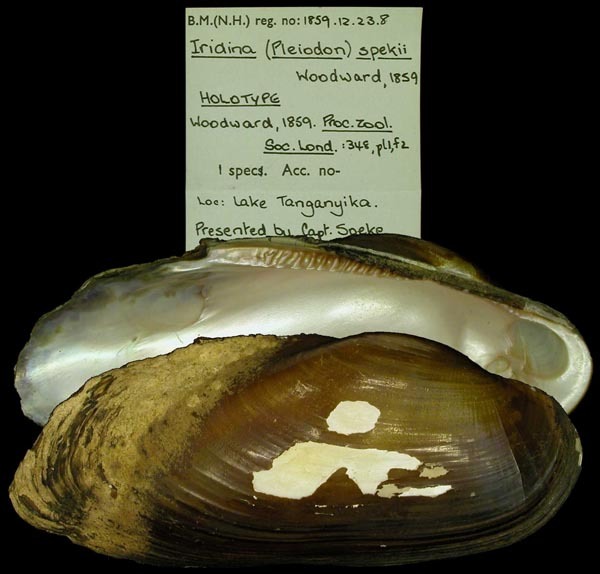 Cyrena radiata E.A. Smith, 1881. E.A. Smith, 1881, Proc. Zool. Soc. London: ??. ‘Woodward’ E.A. Smith, 1881, Proc. Zool. Soc. London: pl. 34, fig. 33a [as ‘Unio burtoni’]. Bourguignat, 1885, Bull. Soc. Malac. France: 7. Pleiodon spekei ‘Woodward’ of Authors. E.A. Smith, 1880, Proc. Zool. Soc. London: 350. Martens, 1897, Besch. Weich. Deutsch Ost Afr. : 256. 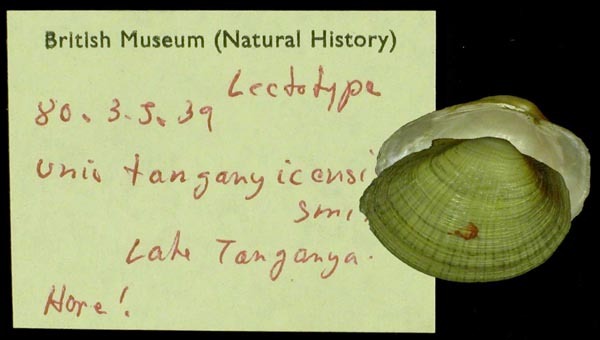 Type(s): HOLOTYPE BMNH_1859-12-23-8, Lake Tanganyika. Spatha tanganyicensis E.A. Smith, 1880. E.A. Smith, 1880, Proc. Zool. Soc. London: pl. 31, fig. 8a [in part]. E.A. Smith, 1881, Proc. Zool. Soc. London: 296, pl. 34, fig. 32. Unio burtoni E.A. Smith, 1881. ‘Woodward’ E.A. Smith, 1881, Proc. Zool. Soc. London: pl. 34, fig. 33a [in part]. ‘Lea’ E.A. Smith, 1881, Proc. Zool. Soc. London: pl. 34, fig. 34b [in part]. Bourguignat, 1889, Bull. Soc. Malac. France: 38. 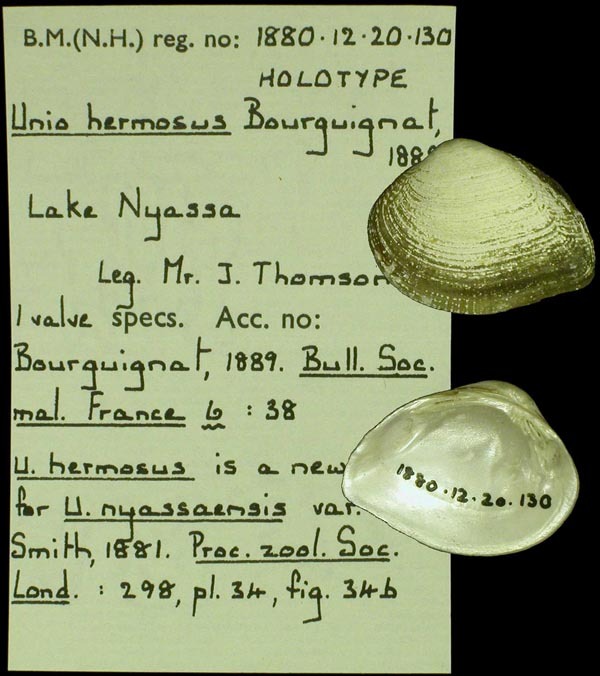 Type(s): HOLOTYPE BMNH_1880-12-20-130, Lake Nyassa. Unio horei E.A. Smith, 1880. E.A. Smith, 1880, Ann. Mag. Nat. Hist. : 429. E.A. Smith, 1881, Proc. Zool. Soc. London: 299, pl. 34, fig. 37. 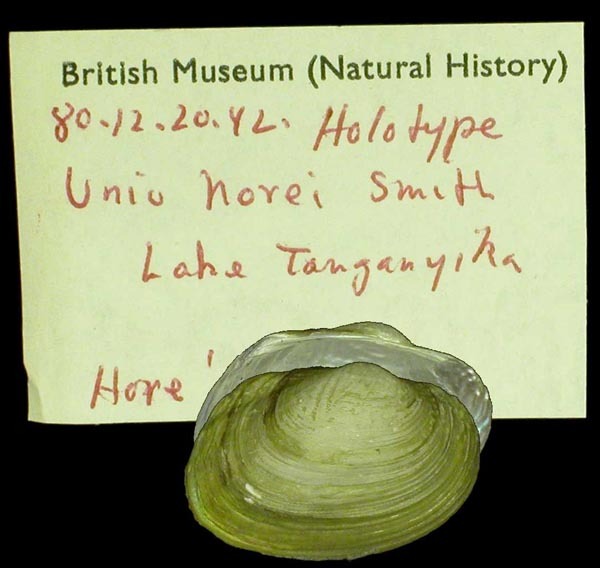 Type(s): HOLOTYPE BMNH_80-12-20-42, Lake Tanganyika. Unio niloticus E.A. Smith, 1880. ‘Cailliaud’ E.A. Smith, 1880, Proc. Zool. Soc. London: 351. ‘Caulliaud’ E.A. Smith, 1881, Proc. Zool. Soc. London: 296. Unio nyassaensis E.A. Smith, 1881. Unio tanganyicensis E.A. Smith, 1880. E.A. Smith, 1880, Proc. Zool. Soc. London: 351, pl. 31, figs. 9-9a. E.A. Smith, 1881, Proc. Zool. Soc. London: 298, pl. 34, fig. 35. Unio thomsoni E.A. Smith, 1880. E.A. Smith, 1880, Ann. Mag. Nat. Hist. : 430. E.A. Smith, 1881, Proc. Zool. Soc. London: 229, pl. 34, fig. 36. Unio nyassaensis var. tanganyicensis E.A. Smith, 1881. E.A. Smith, 1881, Proc. Zool. Soc. London: 298, pl. 34, fig. 34a. 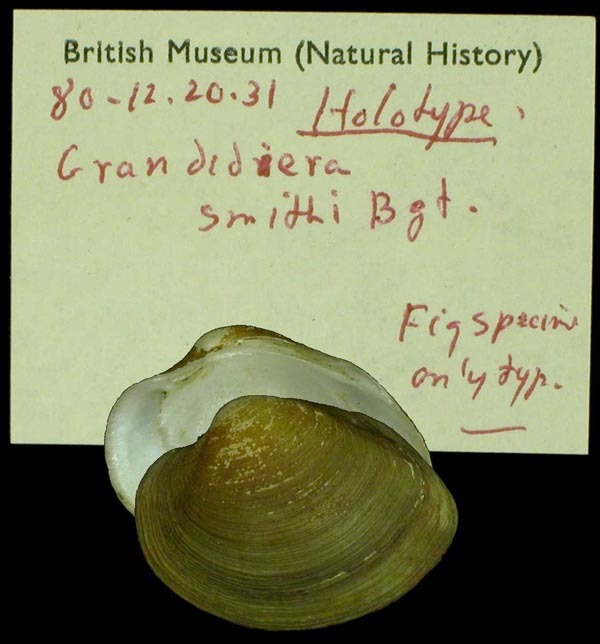 Type(s): HOLOTYPE BMNH_80-12-20-39, Lake Tanganyika. Mutela exotica (Lamarck). — E.A. Smith (1881: 296). Pleiodon spekei [sic] Woodward, 1859. — E.A. Smith (1881: 296). Spatha tanganyicensis Smith, 1880. — E.A. Smith (1881: 296). Unio burtoni Woodward. — E.A. Smith (1881: 297). Unio horei Smith, 1880. — E.A. Smith (1881: 299). Unio niloticus Cailliaud. — E.A. Smith (1881: 296). Unio nyassaensis Lea, 1864. — E.A. Smith (1881: 298). Unio nyassaensis var. aferula Lea, 1864. — E.A. Smith (1881: 298). Unio nyassaensis var. kirkii Lea, 1864. — E.A. Smith (1881: 298). Unio nyassaensis var. tanganyicensis. — E.A. Smith (1881: 298). 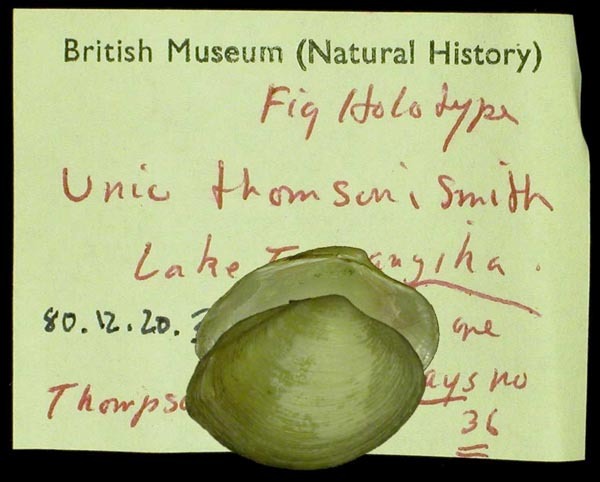 Unio tanganyicensis Smith, 1880. — E.A. Smith (1881: 298). Unio thomsoni Smith, 1880. — E.A. Smith (1881: 299).